I was watching Saturday kitchen last weekend and watched as one of the chefs made the most delightful looking salad out of julienne celeriac. My mouth was watering as they plated up the dish and it was at that point that it struck me, I don’t think I’ve ever cooked or even tasted celeriac. I decided then and there that I was going to pick some up to start experimenting with it. Whenever I go shopping I always buy butternut squash in one form or another. Whether it be pre spiralised, in a lasagne sheet, or in its natural giant form I just like the idea of having a 0sp carb in the house, just in case. For that reason, I always seem to have a whole butternut squash in the cupboard! This week, with the weather getting ever more wintery and cold, I just fancied a nice warming soup for lunch and so I thought it was about time I used up some of my squash stash. This recipe was made at the special request of a lovely lady called Ruth who requested a recipe for a pea and ham soup a few weeks ago. Well ask and you shall receive, here it is Ruth!! This recipe calls for 200g cooked gammon/ham. You can either buy this pre cooked or you can cook a joint yourself. I bought a huge joint for around £4, boiled it and then once shredded, froze the rest in portions to use in other meals. Cooking it myself also meant that I had the boiling water (aka homemade stock) which was lovely. A ham stock cube would be just as good though. Laksa is something that has been on my list of things to make for a good while now and this week I finally got around to it. I love any sort of spicy soup whether it be Tom Yum, Ramen or Pho so I knew I would love this just as much as the rest. 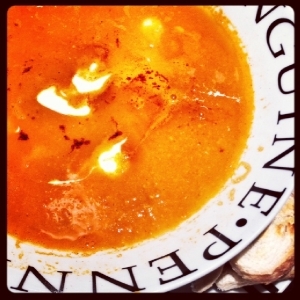 This is a really simple soup that I make time after time as its so simple to make but tastes amazing! I often make it on a Sunday night and because it makes 4 portions it does my packed lunch for work alllll the way til Thursday! Since the weather is still FREEZING I decided to try out a new soup this week which included my love for both spinach and coriander. It’s got quite a few ingredients but it makes a huge batch of soup and it feels like a lovely treat come lunch time. It’s great for using left over veg such as spinach and celery (which we always seem to having knocking around in the fridge) and the ginger, chilli and lemon really give it a lift.